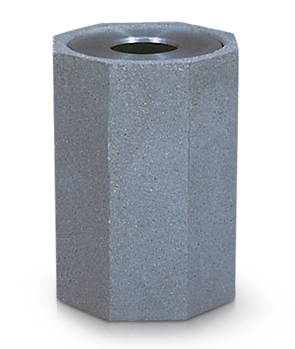 Reduce litter by placing these octagon concrete trash receptacles around your facility. The unique octagon shape has a modern look that is accented by a round trash disposal opening. The sheer weight of this receptacle ensures that it will not walk off your property. 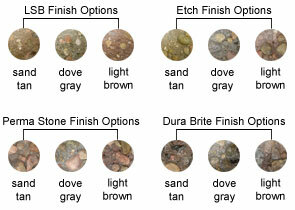 Available in many colors and finishes that blend with the outdoor environment. Rigid plastic 22 gallon liner measures 14-1/2" Dia. x 30"H and is sold separately. 1" Drain Hole at the Bottom. Spun aluminum lid is secured with a vinyl coated cable, and can be powder-coated with any of the colors shown in the lid color options. This octagon precast concrete trash receptacle is available in Light Sand Blast, Etch, Perma Stone, and Dura Brite finish options, and is treated with a water-repellent sealer for ultimate weather resistant durability.